Unlike most people in the western world, we didn’t spend the holidays at home singing Christmas carols. Instead we did what we love most — travel. Since we love Italy and were there only three times this year 😉 , we chose Rome as our destination. With a map in one hand, a handbag in the other and my parents behind us we dove into the urban jungle at the busiest place in town — the Termini train station. Unfortunately our Rome experience started with a negative twist as we immediately became the victim of the typical Rome-crime. “Signore, Signora, take good care of your bags!”, a woman pleaded with us while Boji was buying tickets, and after we got in the tram we noticed it — one of the zippers of my mother’s handbag was open and her mobile and small digicam were gone. Holy #?%§! How did they manage it so quickly? How come we didn’t notice anything?! All guidebooks warn you about this and we thought we’ve taken enough precautions, but it still happened. My parents (who don’t have much travel experience) were shocked and remained pretty suspicious and with mixed feelings throughout the entire trip. But since there was nothing we could do about it, we changed our thoughts back to la Dolce Vita and reconciled with bella Italia. Like most people in the city center we played the tourist game and ran countless kilometers each day, paying tribute to the famous Rome sights: Colosseo, Foro Romano, Basilica San Pietro, the Pantheon, Piazza Navona, Galleria Borghese, Fontana di Trevi, Piazza di Spagna, Monumento Nazionale, la Bocca della Verita … the list can go on forever. You know immediately when you’ve reached the city center because suddenly you are squeezed by the crowd, surrounded by a million tourists and half a million hawkers who push all kinds of flying, jumping, crackling or flashing junk in your face. Others are trying to tempt you with colorful scarves, umbrellas and Gucci bags. As soon as you get rid of one peddler the next one comes with the same things and tries his luck. And as if this was not enough, countless shops make the already the narrow streets even narrower by displaying and selling cheap souvenirs. Rome is much more multicultural than we expected (which we find great), and it’s quite surprising to hear people from Africa, Bangladesh, India or Tibet speak Italian while baking thin Italian pizza for you. In Prenestina, the neighborhood where we spent 4 days, we were pretty much the only light-skinned people. Away from the tourist districts many streets and sidewalks, especially those along the Tiber, are lined with garbage, it smells of urine and you see many poor and homeless people — surely a typical fate for many “cosmopolitan” cities. What a contrast to the splendor and richness of the countless palazzos, piazzas, arches, fountains, shopping centers and the vast number of pompous churches! I’ve never seen so many churches in such a small area as in Rome. 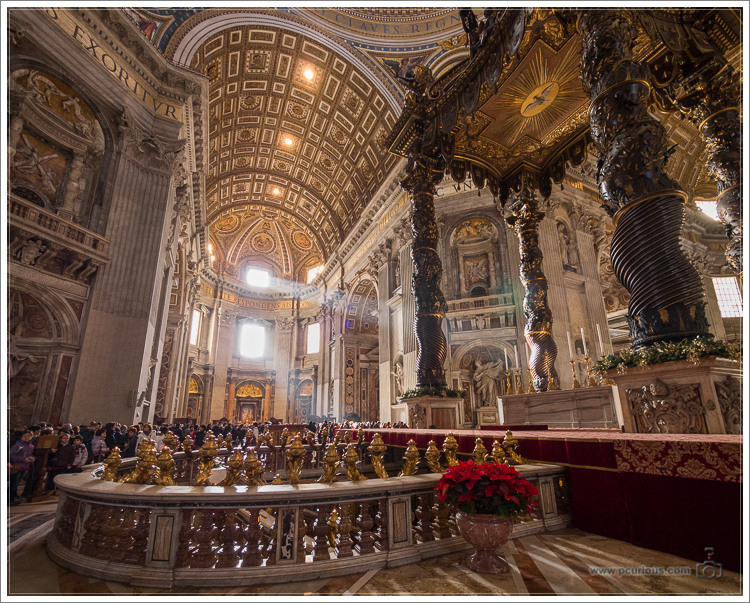 They are lined with so much gold, marble and magnificent mosaics that your jaw drops every time. And you feel tiny and insignificant next to those giant pillars that you follow with your eyes all the way up to the colorful and formidable domes. Naturally we are impressed by the devotion and amazed by what our ancestors were capable of, but after the fifth church in a radius of 250 meters a bewilderment starts growing among us. The whole city is dotted with churches, one richer than the other. “What for?”, we ask ourselves and begin to philosophize. Our guide book told us that the suburbs Trastevere and Testaccio were quite authentic and free of tourists, but instead we were greeted by crowds and restaurants with tourist menus. We didn’t have much luck finding any of the cheaper osterias and trattorias. Everything was called Pizzeria Ristorante, but some of them didn’t even serve pizza — it was mostly expensive and elaborate menus. We looked further and were greeted with more disappointment and various attempts to cheat us. Someone on the street pushed a piece of paper in our hands advertising home-made pizza for 5€ only. It’s too cheap to be true, but as soon as we showed the tiniest bit of interest they escorted us to a nearby restaurant where we got a menu with totally different prices. When we asked about the 5€ pizza they told us that that’s next-door and only for take-away. So we got up and went to the place next-door. The pizza there was not 5€, but it looked really good and there was a large sign behind the seller with all prices. However when he weighed the pizza he took 24€ per kilo instead of the advertised 16€. We told him that he should please take the real price, he apologized profusely, then typed in 19€. So we walked out of the door again totally frustrated. In a restaurant they tried to charge us higher prices for antipasti, because they apparently served us larger portions (that we didn’t ask for) and instead of 12% servizio they calculated twice as much. Four times in four days is no longer a coincidence! I, and I’m sure many other tourists, do not mind paying appropriately if the service is right and the food is good, but I want transparency. I am outraged and insulted by this constant audacity. Or rather, I am disappointed by the people. Of course there are also many positive things to mention. For example the neighborhood just south of Corso Vittorio Emmanuelle II is the most beautiful part of the historical center (e.g. Via del Pellegrino, Via dei Cappellari, Via di Montoro and Via dei Banchi Vecchi). Allow yourself to get lost and explore the narrow winding medieval streets that are home to tiny craft shops and art studios, jewelers, carpenters, book and bicycle shops, carpet shops, etc. Here we were able to experience the eternal city without tourist masses for the first time and felt a bit like being transported back to the Middle Ages. Our personal highlight was the discovery of a couple “hidden” courtyards. All you see from the street is a small gateway that seems to end within two or three meters. But if you walk in, you see that it makes a 90° turn and leads to a larger area surrounded by several buildings. In this area the residents plant flowers, have tables and chairs for sitting, cats walk around and you get to meet some typical Romans. At dusk these courtyards and gateways radiate with faint warm glow onto the larger street and lure you with an incomparable and authentic Italian atmosphere. Of course not all courtyards are this nice, but don’t be shy, look around, and you’ll experience some great surprises. 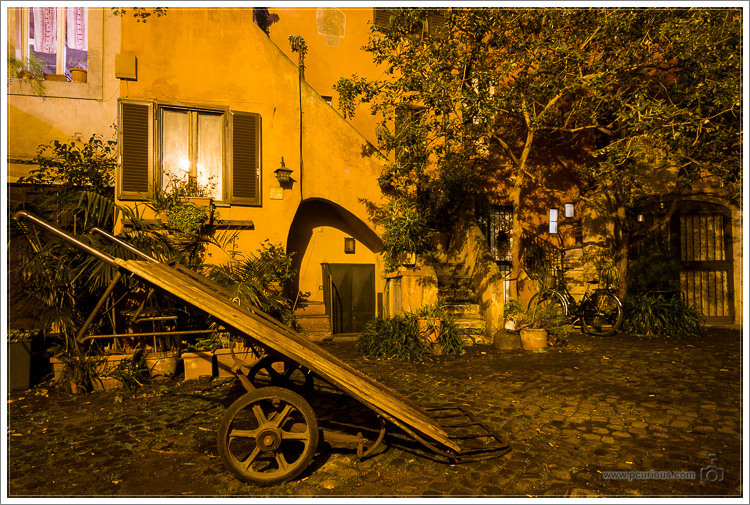 You can find some pretty streets in Trastevere too, but this is no longer the poor and artistic neighborhood as many guide books suggest. Like elsewhere a multitude of street cafés, restaurants and street vendors fight for the attention of tourists. But the area east of Viale Trastevere, far quieter and more authentic than the rest, is still worth a visit. But watch out when choosing where to eat — here are two of the places that tried to rip us off. Since we ran out of time, you’ll have to find out for yourselves whether the neighborhood San Lorenzo (east of Termini) holds all the promises that our guide book makes: traditional working-class areas with unpretentious charm, simple houses and restaurants, traditional Roman cuisine, good value and excellent pizzerias. Unfortunately we also didn’t manage to explore the farmer’s markets Mercato di Testaccio or the covered markets on Piazza dell‘ Unità and Via Turati / Via Principe Amedeo. Your feedback on those will be greatly appreciated. 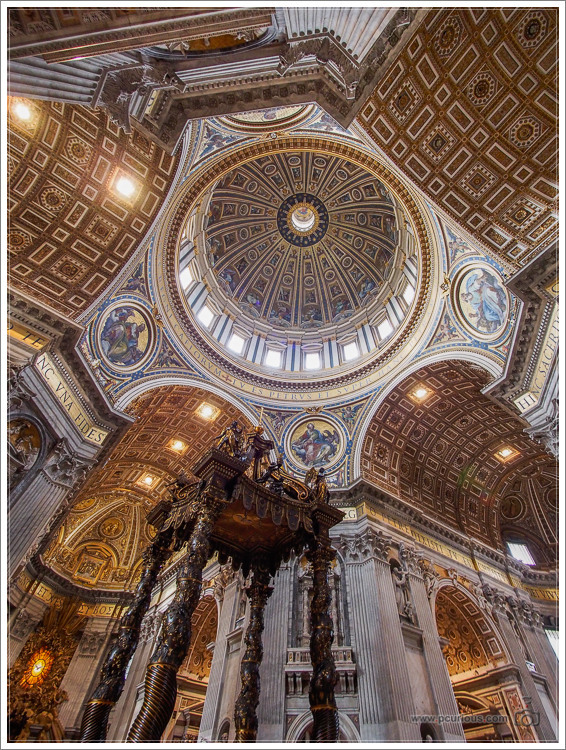 For a nice view over the city we recommend the dome of St. Peter’s Basilica. It will cost you 5€, and you’ll have to climb 550 stairs, but it’s easy to do. For 2€ extra you can take an elevator, but it only replaces the first 230 stairs. You will be climbing between the outer and inner walls of the dome, so avoid if you are claustrophobic. 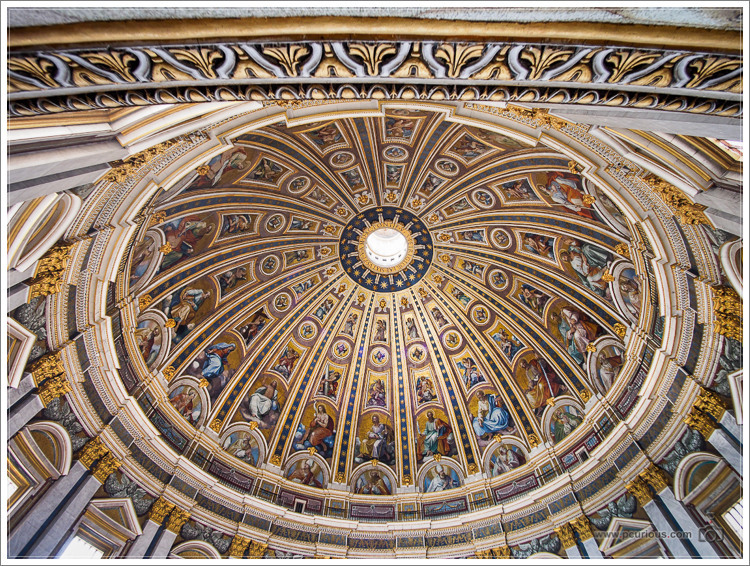 The highlight of this tour is without a doubt about half-way up, where you walk directly underneath the huge and magnificently painted dome. 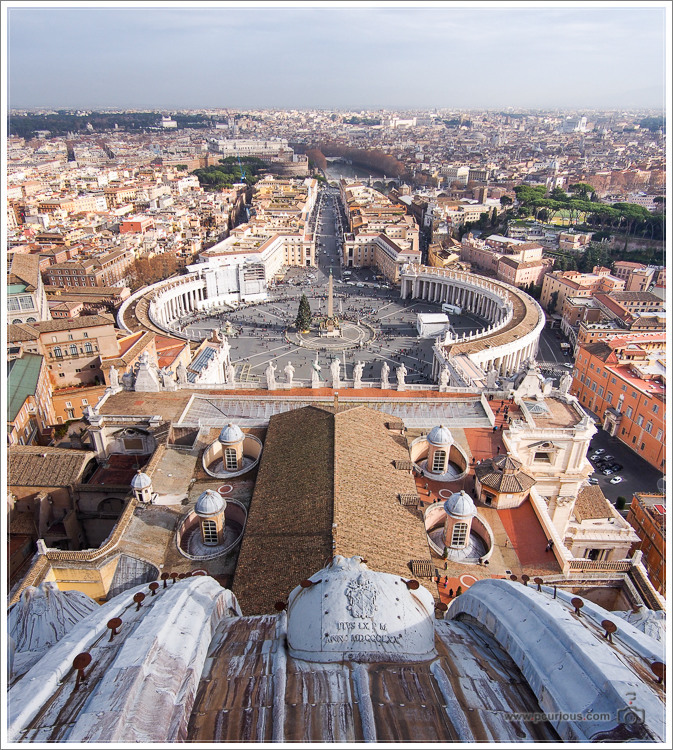 You can also look down into the basilica, where the hundreds of visitors look no larger than ants crawling around. Unfortunately you cannot photograph downward because of a very high fence in front of you. Another very nice, and free view is from the Pincio Terrace (above Piazza del Popolo) and from the Gianicolo hill in Trastevere. For photographing I found the terrace in front of the Santa Maria Aracoeli and the Piazza del Campidiglio very good because you can use the rooftops of the Eternal City as your background. And when you’re already there, use the chance and look through the archway towards Via Monte Tarpeo towards the other side — you will be rewarded with a great view over Foro Romano and the Colosseum in the background. 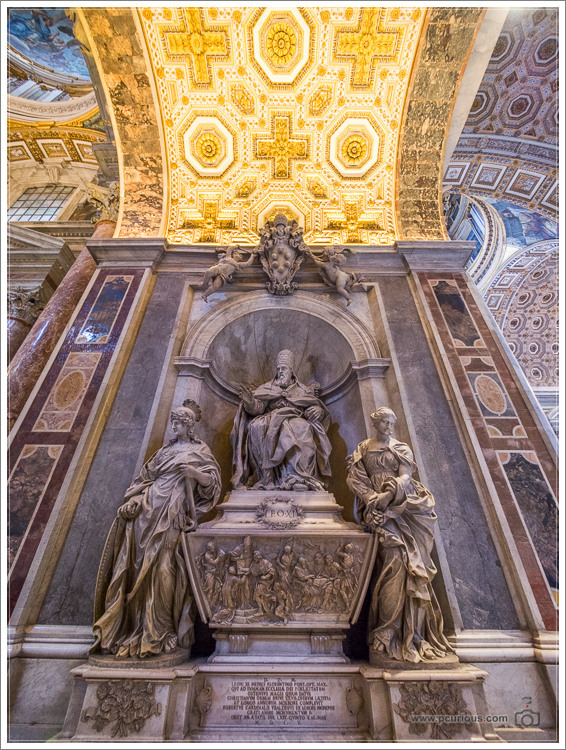 Even though I spoke rather negatively about the churches a few paragraphs above, you should nevertheless visit several of them and experience the thrust for grandeur and splendor for yourself. 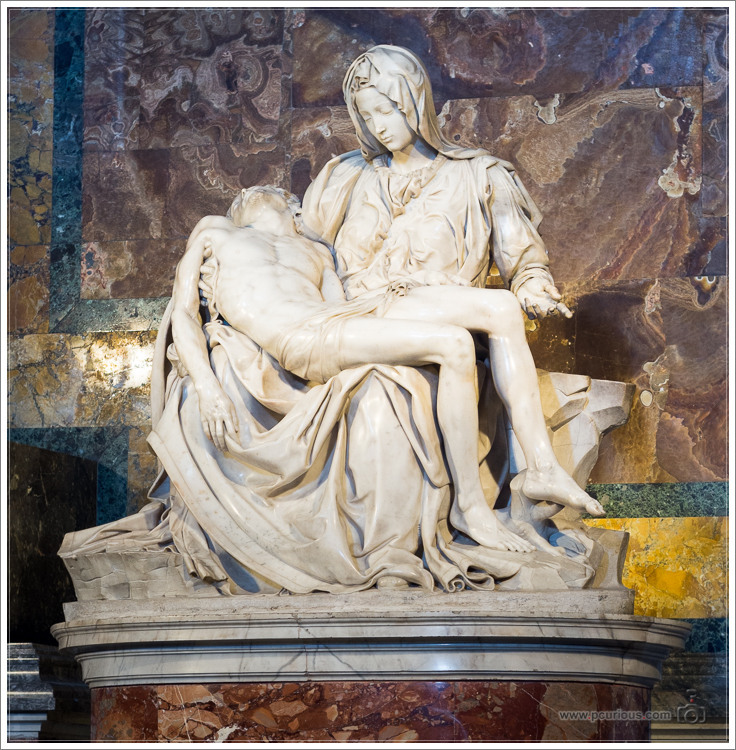 Admission to all churches and to the Pantheon is free. 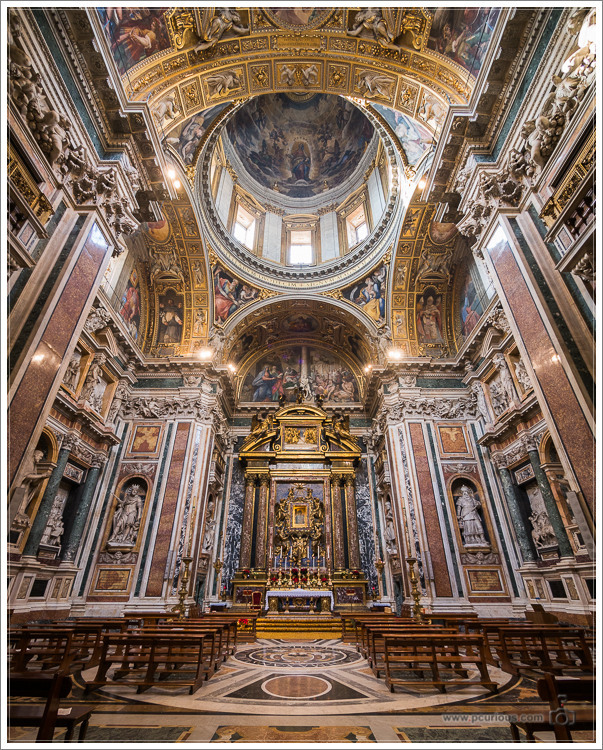 In addition to St. Peter’s Basilica you might also like Santa Maria in Aracoeli, Santa Maria Maggiore, Santa Maria Prassede and S. Maria in Cosmedin (Greek Orthodox). The Pantheon is probably only interesting in strong sunlight or when it’s raining. 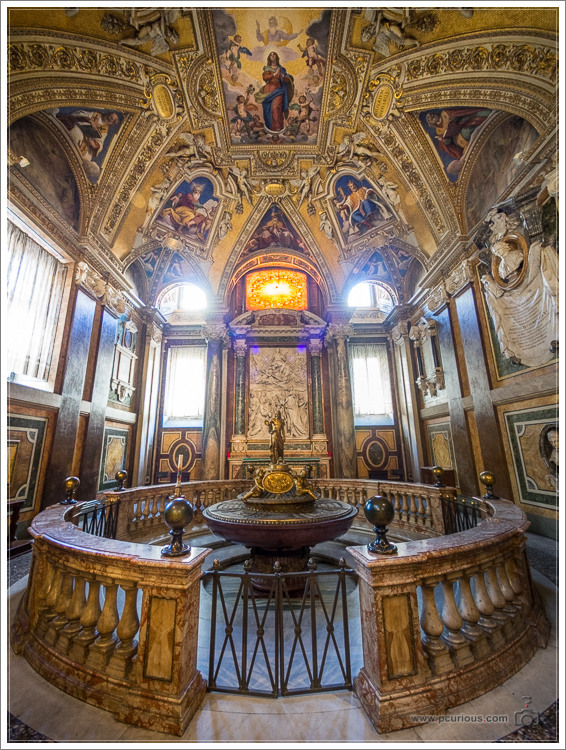 Rome has hundreds of museums, but since we’d rather experience the life of living and breathing people, we visited only one — Galleria Borghese. It’s really great (thanks for the tip Sibylle! ), and we can recommend it wholeheartedly. Two tips from us: get the audio guide (5€) and start upstairs (while everyone is downstairs), then enjoy the superb first floor all by yourself in the second half of your time. Trattoria Dal Pollarolo near Piazza del Popolo: Via Ripetta 4, Tel: +39.06.3610276, http://www.dalpollarolo1936.it/. We were here twice and both times there was a line in front of the entrance of mostly Italians waiting for a free table. The food and wine are really great and the service is extremely quick and friendly. Far away from the city center but close to our Airbnb apartment we also enjoyed the small family-run trattoria “Pane & Vino” (Piazza Ragusa 61, +39.06.347.8088107). The carbonara is simply out of this world! 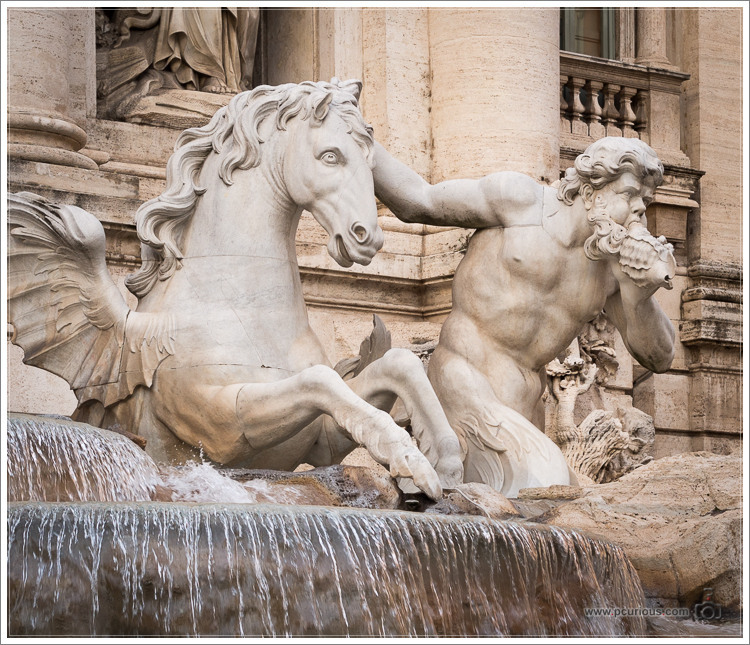 Finally, one great thing about Rome are the countless fountains with drinking water, so you don’t have to carry heavy water bottles in your camera bag or daypack. We love Italy — its lightness, its people, the food, wine and weather — but most likely we will not be visiting Rome again. 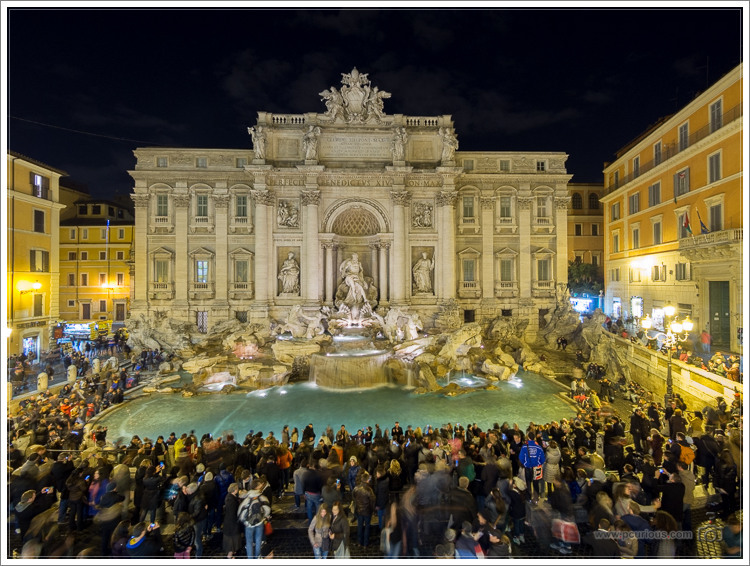 Nothing against Rome itself — it’s just like any large city: crowded, noisy, hectic and highly commercial. The small shops with their authenticity and flair are doomed by the pressure of consumerism and the people are turning more and more ruthless and dishonest by the day. We find this very unfortunate, so for the future we’ve decided to focus much more on nature, rural areas and smaller cities, in Italy and elsewhere in the world. But even with this limitation Italy has lots to offer — just thinking of Tuscany, Cinque Terre, Sicily and the Dolomites warms my heart. Wonderful – congrats to both of you! Oh, and about the cities: yes, we’ve been to Genoa, and were also quite stressed out by the (mostly African) folks around the harbour, ripping you off. Otherwise, very nice. Love the normal Italian people. I live abroad for the most part of the year, but i can’t help but feeling involved. I still belong to my country, at least culturally. That’s why i’m ashamed by the behavior of many italians. I spent a few days in Rome, after 3 months in Thailand and Laos. My ex lives in Rome, in Monteverde, just behind Trastevere. I have been shocked by the fact that some roman neighborhoods, once genuine and very representative of the true heart of Rome, are becoming tourist ghettos, just like the main tourist attractions, where the organized tours congregate. I’m not saying that the authentic Rome disappeared for good, but it’s depressing to notice that it has shrunk so much. The sad thing is that in Rome the hawkers are as many and as pushy, but there are many, many more thieves! Stazione Termini is Rome’s inferno. While street peddlers leave alone the italians, thieves don’t have such courtesy. Italians who are not aware of the peculiar nature of Stazione Termini, can easily become victims of theft. If you “know”, they feel it, and you’re not targeted. Next time you come to Italy, consider coming to Bologna. It is a bit like Florence, with a few artistic masterpieces and without 99% of Florence’s tourism! Dear Paolo, thank you very much for your insightful comment! And about Bologna, yours is the second recommendation for this city, so I think that we’ll put it on our list of future destinations.